I like to try to maximize the amount of time my garden is in production. I do this by using two methods. The first is to plant cold tolerant crops like kale, broccoli, spinach and other hardy vegetables. The second method is to extend the growing season by using season extending techniques like cold frames, cloches, row cover and low tunnels. This fall and early winter has been milder than in past years and has been great for cold season vegetables. I planted 16 “Premium Crop” broccoli seedlings in in early September with hopes of harvesting fresh broccoli for Christmas Day dinner. Needless to say, I was not disappointed. 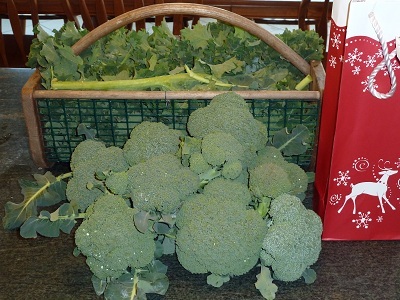 As the picture shows, I picked both kale and broccoli on Christmas day. 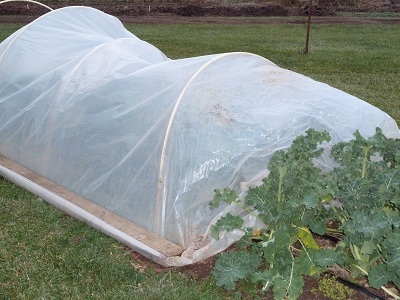 To extend my broccoli harvest, I covered the broccoli which is a little less cold tolerant than kale with a low tunnel made out of half inch PVC and a plastic sheet. The plastic retains heat, just like a greenhouse. It worked like a charm and in fact is still working. I have been enjoying vegetables from the garden this late in the season for the first time…carrots, kale, claytonia, spinach, lettuce, etc. My low tunnels are covered with Agribon 19 AND 30. So far so good, but the temps are dipping very low now, so we will see. Thanks for sharing! Per Eliot Coleman's techniques, I rigged up a tunnel using Agribon-19 and plastic sheeting. The sheeting covers my hoops, and the Agribon is attached to the sides of the hoops so that the layer is just above the tops of the plants. This worked beautifully last year, and I'm hoping for a repeat this winter season.